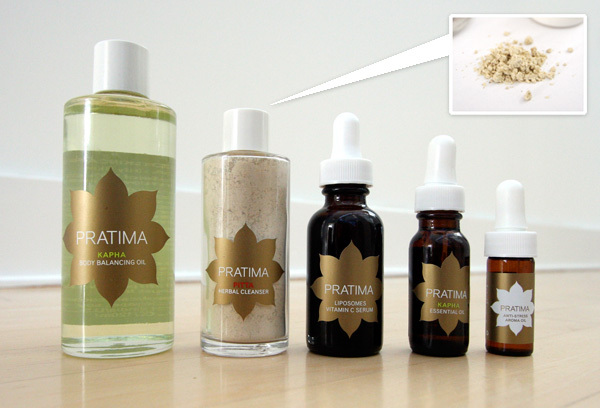 Prairie Vodka wants you to “let the prairie in” ~ and they aren’t kidding around! 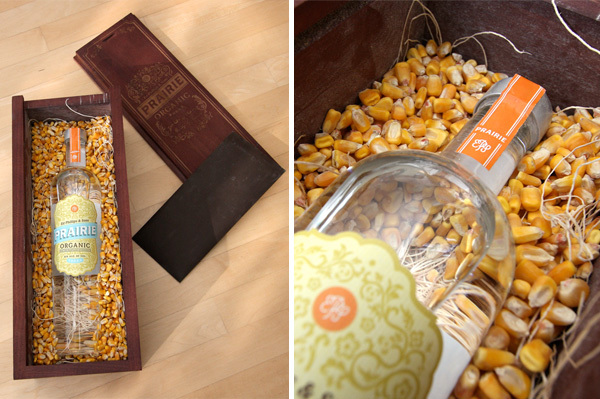 When they sent a sample bottle over, i was literally overwhelmed with the prairie… in the form of a gorgeous intricately laser engraved wood box filled with their certified organic #2 yellow corn (which costs twice that of conventionally farmed corn) and straw… all protecting the deliciously smooth bottle of Prairie Vodka (it really is THAT delicious). If you recall, i highlighted the incredible nature/prairie meets city photography on their website previously… and their label and branding design is gorgeous, but now combining that with the deliciously smooth taste and mind-blowing packaging this is one sample that will be hard to beat… i’m smitten. Oh, and lets not forget - Prairie Vodka’s got more behind it than just great vodka - it is actually the result of a “unique partnership between a 5th gen distilled spirits company and a co-op of over 900 Minnesota farmers who are stakeholders in the brand. The distillery has earned Oregon Tilth organic certification. Each batch is distilled as many times are necessary to yield the desired character and smoothness. In the spirit of self-reliance, the distillery converts leftover corncobs and other biomass to create biogas energy for powering the stills and returns distillers grains, a coproduct of distillation, to farms for reuse as feed. And because Prairie is crafted many thousands of miles closer than imported brands, far less petroleum is consumed to bring the vodka to market.” Oh, and it’s also certified kosher by The Orthodox Union. And did i mention the packaging was mind-blowing? See more pictures of the unboxing on the next page! 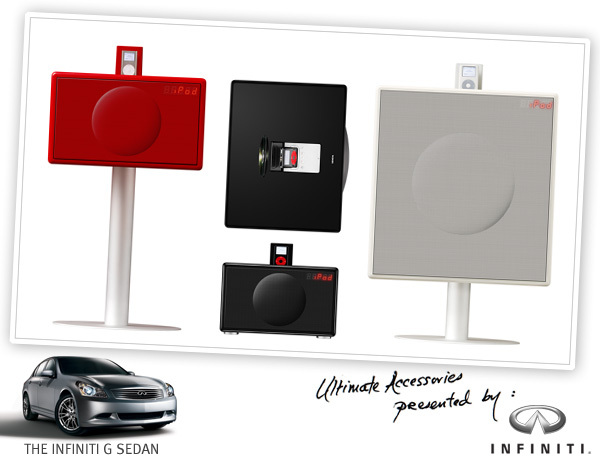 NOTCOT Note: This is the fourth in my series of Ultimate Accessories posts which have been sponsored by the new Infiniti G Sedan! As with any sponsored content ~ these posts are done - my way - my product choices, my content, and they help me keep doing what i love! When picking some of the “Ultimate Accessories” for these posts, Geneva Sound systems always pop to mind, maybe it’s because i’ve been so tempted, but between moving and traveling quite a bit, i’ve had trouble committing to the pricetag for these gorgeous (and awesome sound quality!) audio systems! Ok, let’s be honest, that glossy lacquered finish in the red, white, or black are far too appealing ~ and when on the floor stand, just perched so perfectly, who can ignore it in a room? Details not to miss: the cd slot, is just that - a slot in the top of the system. The hidden red LED display that shows your settings, etc from behind the speaker…. when you’re ipod isn’t docked, everything is hidden under a panel on the top. I’ve toyed with buying one of these for YEARS now… and now, to further tempt me, they debuted a prototype of the perfect black glossy tv stand/shelf with built in sound system… its gorgeous, more pics on the next page. 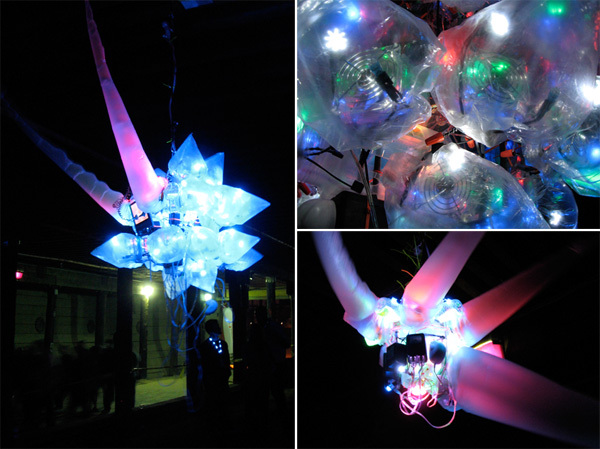 Another find at at GLOW ~ was a collection of suspended robots under the pier, EX-SE-08, Shieh Chieh Huang. Made from plastic bags, plastic bottles of various sizes, computer fans, portable dvd players - all combined with circuit boards and what looked like many power adapters for the larger pieces… these robots were buzzing and breathing (well the bags looked like inhaling and exhaling oxygen bags that come down in airplane emergencies?) and spinning about - while filled with glowing lights, black lights, and uv glowing liquids… It was mesmerizing to say the least, especially when i wandered back in around 5am in a bit of a haze… i ended up taking more video of these creatures than pictures, so check out the video below for an overview of them in action, and a few more pics as well on the next page! Finding the perfect tshirt is right up there with the search for the perfect jeans. The fact that there’s so much out there makes it that much more difficult. So here are some that don’t sacrifice comfort for looks, and aren’t in your face with some tacky graphics. 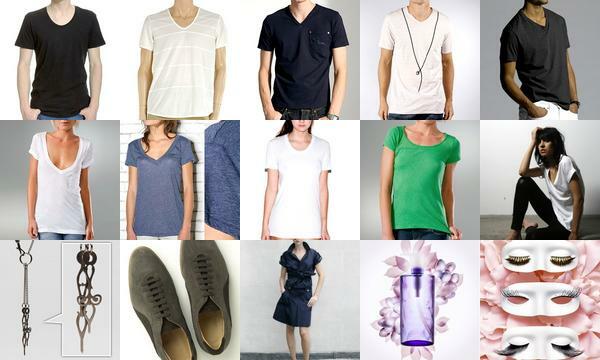 And if you’ve already found your perfect tshirt (feel free to share it with us on NotCouture! ), then the last row is full of other random goodness from this week. I’m definitely loving the insane Shu Uemura x Viktor & Rolf eyelash collaboration that alizababy posted! NOTCOT Note: Here’s another fun one from our resident architect, Anna (Sub-Studio)! David Lewis of Lewis.Tsurumaki.Lewis was one of my studio professors back when I was studying architecture at Cornell and he was very influential in the way that I learned how to draw and present information. 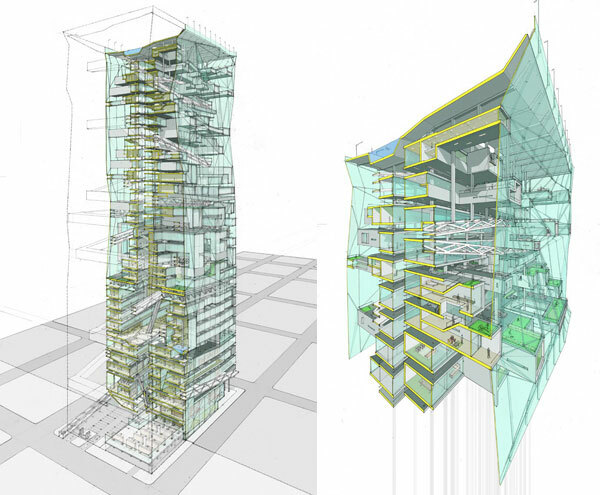 LTL has perfected the art of multi-media drawing, using computer models to generate the building forms and to create severe, impossible perspectives and sections, and then hand-drawing hyper-detailed drawings which are layered on top of the model. The meticulousness of the drawings is amazing and I love the texture that the pencil provides - the more intense and detailed a section of a drawing, the dirtier it is. Besides great drawings, LTL also creates really beautiful built spaces that are focused on materials and construction methods. The same attention to detail in their drawings shows up in their built work. 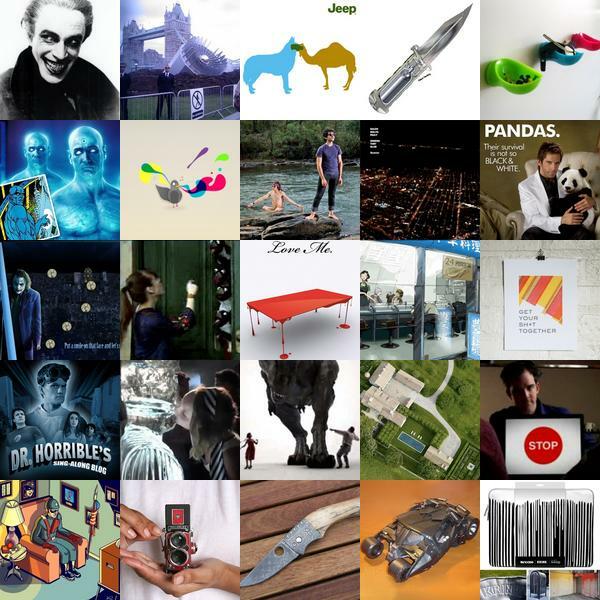 I’ve only chosen to include their restaurant work in this post (after the jump), but LTL also has a bunch of great large scale projects and competitions on their website. If you want to see more of their drawn work, you should definitely check out a recently published a book of their work, Opportunistic Architecture, or an older publication, Situation Normal, by P.A. Press. 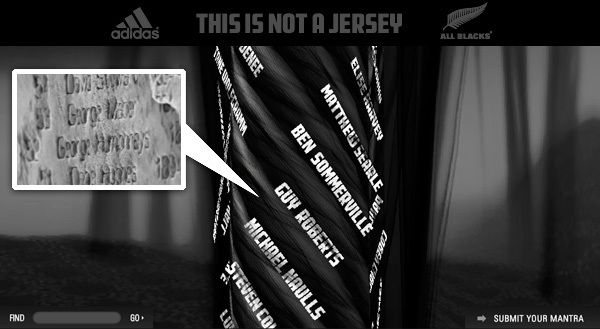 On fascinating new uses for nanotech-engraving… Adidas has launched adiThread on their “This Is Not A Jersey” site - where supporters of the New Zealand All Blacks team can get closer than ever to the players, and literally come together to form the thread of the jerseys with their names! 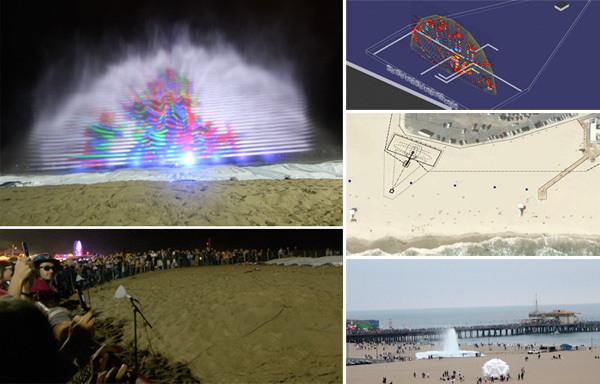 See stills from the video, and more from the campaign below. Even go add your name to the thread at adiThread! 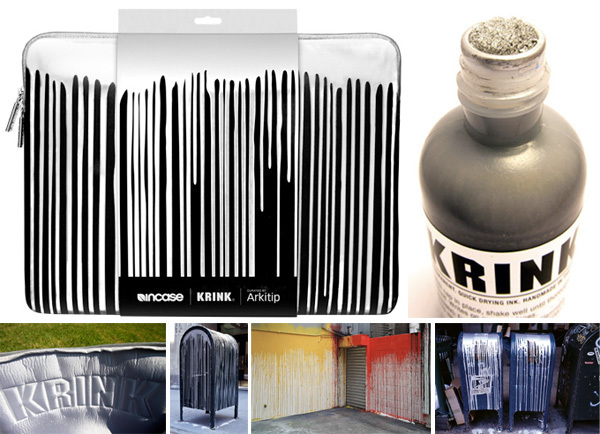 Incase has teamed up once again with Arkitip Magazine, and this time they’ve pulled in one or my favorite artists, Craig Costello aka “KRINK” aka “KR”, the legendary creator of KRINK inks and markers and artist behind those awesome silver drippy mail boxes! So this new KRINK Sleeve is the first in the “Curate by Arkitip” series. First impression, was being smitten by the silver on black drippiness, so messy, yet so clean. Next thing to hit me… although it is an awesome art product, the quality is incredible, but then again what else would you expect from Incase? This would be such a fun case to carry into a formal meeting… if not just to see what the reactions are like! Anyhow, go see the many pics on the next page, as well as the video with behind the scenes on how this sleeve came to be. NOTCOT Note: This is the third in my series of Ultimate Accessories posts which have been sponsored by the new Infiniti G Sedan! As with any sponsored content ~ these posts are done - my way - my product choices, my content, and they help keep the site free! For any camping trip, or just one in each car, this has definitely made my list of great gifts and emergency kits. I got my hands on one of the White Red Cross co-branded FR 1000s, so check out a full unboxing and up close shots of some of the details that show just how high the quality is! 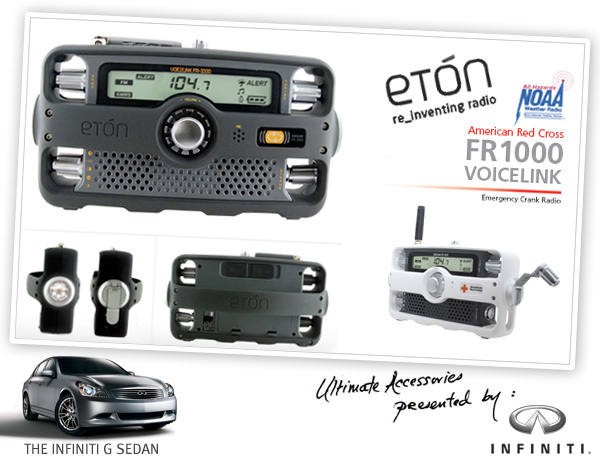 Also embedded the Eton product video for your viewing pleasure. 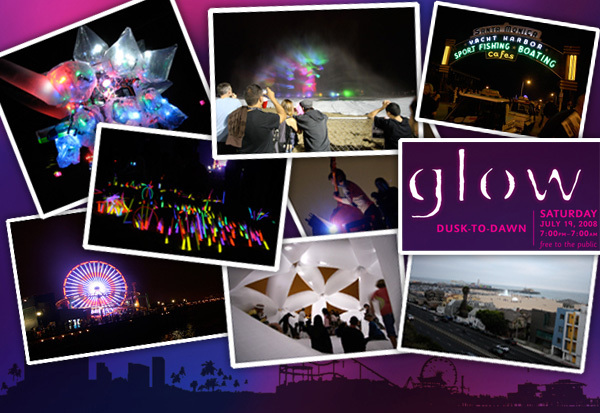 As with all our roundups, click the images to find out more! As you can see, this week these aren’t your usual drinks! So for those of you asking “What is Molecular Mixology?” - Well, lets begin with Molecular Gastronomy, which Peter Barham says is “The application of scientific principles to the understanding and improvement of domestic and gastronomic food preparation.” and Harold McGee says is “The scientific study of deliciousness.”… Molecular Mixology = Art + Science +Drinks = unexpected multisensory experiences and experiments! Liquids take the forms of liquid filled spheres (as tiny as caviar, as large as tablespoons), cotton candy, gels, dusts, sorbets, foams, infusions and more. Your traditional martini can transform into a Martini Infused Cucumber or Martini Sorbet with Olive Caviar ~ as you can imagine, the forms and experiences drinks can take are now nearly endless! This weekend on Liqurious i’ve been rounding up all that i can find, which ended up being articles, recipes, videos, etc ~ and the definite leader in the Molecular Mixology space (particularly online), Jamie Boudreau, , who blogs at Spirits & Cocktails, and is even moderating the seminar on the subject at this weeks’ Tales of the Cocktail. 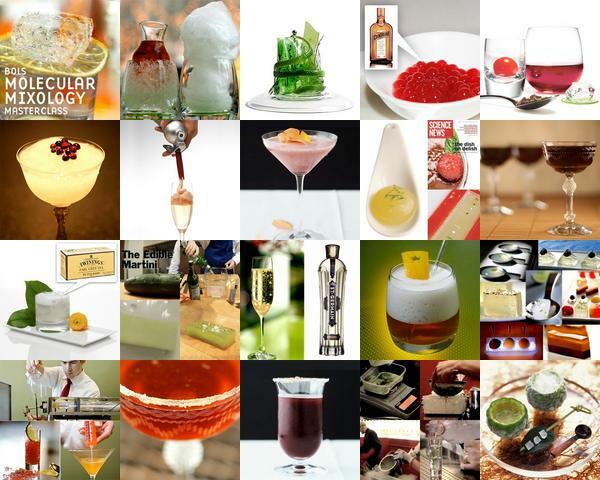 So, see all Liqurious posts on Molecular Mixology here! And feel free to share others you find or write about! You can be certain that i’ll be experimenting with Molecular Mixology soon! One of the best resources i found for all of your Molecular Gastronomy questions, an incredible supplier list, and the most comprehensive book on ingredients/techniques/recipes… see Khymos. NotCouture user “smallsociety” posted the crazy sequin covered military hooded jacket in post #2319 and since then I’ve been thinking about how we incorporate bright and shiny things into our wardrobes. In this short NotCouture roundup (it’s short because, honestly, I’m enjoying being completely zombified by a different type of bright, shiny object in my living room.. my new tv) we’ve covered a few of the bases, from jewelry to over the top stuff like an LED lit dress and metallic slip-ons for guys!